This week’s Music in the Park will be a fitting celebration to the region hit hard by fire and all those tireless first responders and other volunteers who supported their efforts. Join the crowd Thursday August 20 at 6:30 p.m. at Oliver Community Bandshell for the Kettle Valley Brakemen. The concert will include a special acknowledgement to all first responders, who will be feted with a dinner at the Community Hall that same evening. The community park is the place to be from 4:30 onward: a great evening market with produce, crafts, raffles, info booths, and gift items, kid’s activities including face painting and bouncy fun, food vendors for pic-nicking, and a beer and wine garden for raising a toast to the firefighters. The music gets going a little after 6:30 and doesn’t let up until 8:00 p.m. Please bring a donation for your admission, and a little extra for your shopping, food, and fun. For 18 years the overall-clad Brakemen have toured from the coast to the Kootenays regaling concert goers with true stories and original songs about B.C.’s colourful railway history. With 2015 being the 100th anniversary of the Kettle Valley Railway, The Brakemen have put together a completely Kettle Valley show. For those who’ve never seen one of their concerts, The Kettle Valley Brakemen are heritage entertainers and what they do is unique. A Brakemen show is a series of brief stories and original songs about B.C.’s colourful steam rail history. The songs either complete or complement the stories. Each performance finishes with a couple of singalong numbers. So audiences get a slice of B.C. 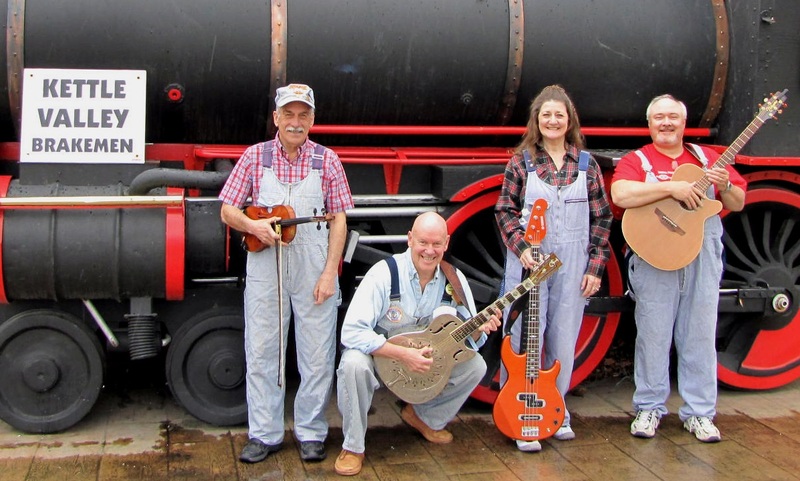 rail history, a concert of folk/bluegrass music AND the chance to participate. The Oliver Community Arts Council thanks their corporate sponsor, Valley First Credit Union. Please remember to support their Feed the Valley campaign by making a food bank donation at the local branch any time. We also thank our partner Oliver Parks and Recreation Society for helping us grow our concerts into one of the best family entertainment events around! And thank you to our faithful audience — there’s one more week to go on Thursday August 27 with vintage pop duo Up the Crick.